Tomorrow officially starts football season. Isn’t that crazy? It feels like the Superbowl was just a few months ago. I live in Texas, but I always root for the NY Giants. They aren’t looking too hot in pre-season, but I am just going to have faith that they’ll step up their game. 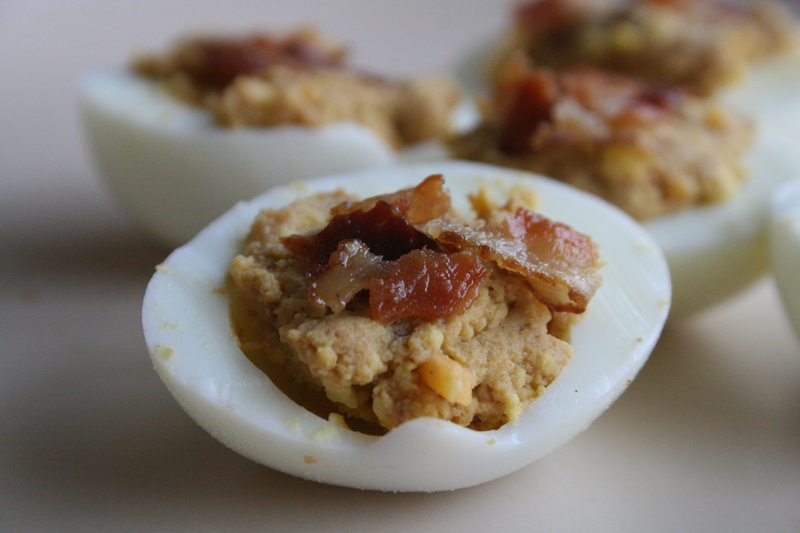 To celebrate the return of America’s favorite past time, and to use up the rest of the hardboiled eggs from my Tomato Basil Deviled Eggs recipe, I created these bad boys for a tailgaiting party. 1. Gently scoop out the egg yolks and mash them all in a small bowl. 2. Mix the yolks with the remaining ingredients before scooping the filling back into the egg white. 3. Top with more bacon, if desired. This entry was posted in Appetizers and tagged bacon, bbq, bbq sauce, cheddar cheese, cheese, deviled egg, egg. Bookmark the permalink.